Removing a project from Timely is really quick and easy. Just remember that once a project is deleted, all the entries associated with it will be deleted too – and you can't get that project data back! We recommend archiving projects you're no longer working on instead. That way, the related data will be available on Reports and you can always reactivate the project as needed. If you have lots of projects on your account, use our awesome search bar to locate the one you want to delete. Click on the project's name to navigate to its individual project page. 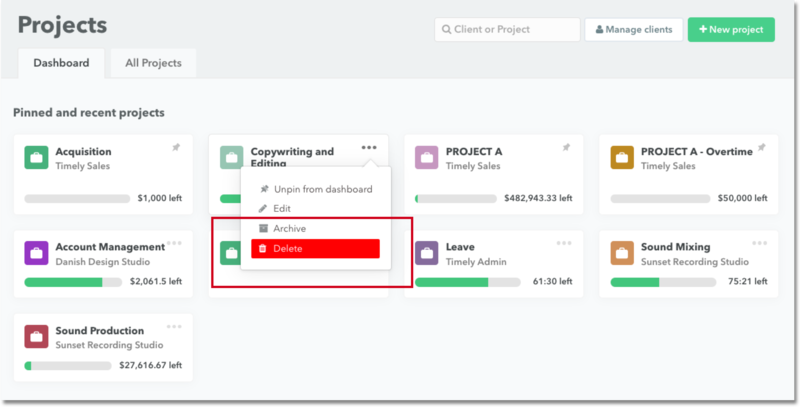 Then use the "..." and select "Delete" to remove the project from Timely. If you're looking to delete a pinned project, you can remove it directly from the Project Dashboard Page. Open the drop-down on the pinned card and delete.